The Texas Energy Council is a collection of industry organizations working together to provide scholarships and educational opportunities for students pursuing careers in energy. TEC has no professional staff and is completely run by volunteers so that proceeds raised by the annual conference benefit directly the students, scholarships and other relevant educational programs that TEC supports. Supporting TEC and the symposium directly benefits students. Raises in sponsorship levels and symposium costs enable TEC to keep up with the rising costs of education and needs of students. 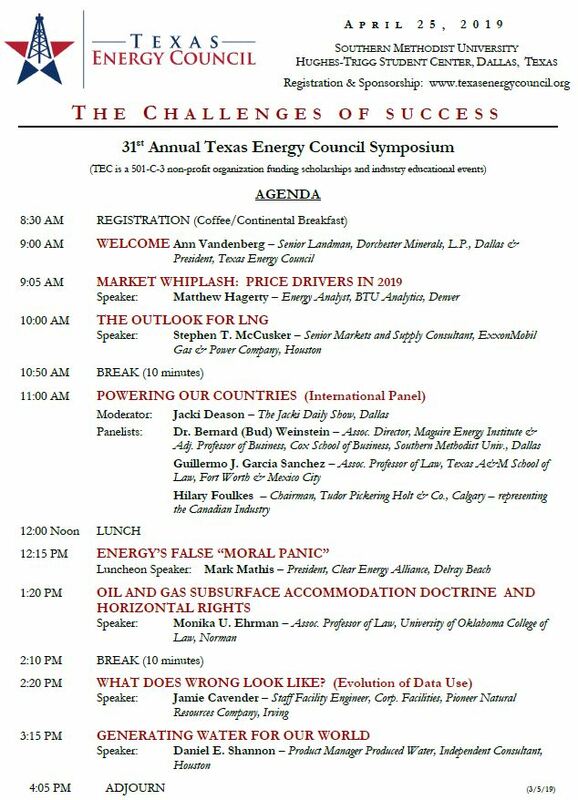 The 31st Annual Texas Energy Council Symposium addresses the “Challenges of Success”. We have an exciting line up of speakers and panelists this year, and as always, our fundraising helps support scholarship opportunities for students pursuing careers in the Oil and Gas Industry. • The registration starts at 8:30AM in the downstairs ballroom of Hughes-Trigg Student Center at SMU (see below for details). • Valet parking is available (see below for details). • Complementary Valet parking is available at the top of Bishop Blvd. near the flag poles, and self-parking will also be available throughout campus.